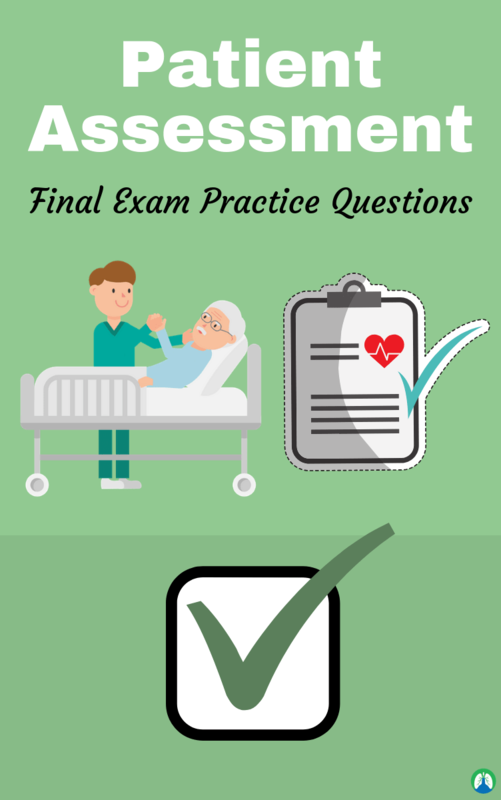 Are you preparing to take the Patient Assessment Final Exam in Respiratory Therapy school? If so, good, because this is the right article for you. That’s because, below, you can get access to our study guide that lists out a variety of practice questions covering a wide range of topics all about Patient Assessment in respiratory care. Now, of course, each and every Respiratory Therapy program is different, but still, this study guide will serve as a fantastic review for much of the information that you learned throughout the semester concerning most of the topics within your Patient Assessment course. So if you’re ready, let’s go ahead and dive right in! 1. The physician orders 28% oxygen to be administered to a COPD patient who is extremely short of breath. Which device will most accurately achieve this? 2. In which of the following conditions would you NOT recommend keeping the dependent (good) lung in the upright position for better oxygenation? 3. A patient with a tracheostomy tube is receiving humidity via a heated wick humidifier. What temperature should the heater be kept at in order to provide proper humidity to this patient? 5. Which of the following statements concerning aerosol particles are needed to ensure lower airway and alveolar deposition? 6. Which of the following cleaning methods sterilize equipment? 8. The physician has ordered an active 3-year-old to be placed on 40% oxygen. Which device would you recommend as being the most tolerable for this patient? 9. An RCP is ensuring that a patient is receiving 40% from a nebulizer with an aerosol face mask. When analyzed, the reading is 65%. The RCP should do which of the following? 10. To protect yourself from contamination by a patient who coughs violently during endotracheal suctioning, which of the following should be done? 11. As a general rule, most hospitals require that infectious waste and body fluids be placed in which container? 12. Which of the following are true statements regarding needle and instrument precautions? 14. Which of the following O2 administration devices is capable of supplying all of the patients inspired gas? 15. Which of the following are recommended guidelines to minimize the spread of infection by equipment or procedures? 16. A COPD patient is experiencing dyspnea and a dry cough on a day when the temperature is 33 degrees C. The air can hold 36 mg/L of humidity, but the content is actually 28 mg/L. What is the relative humidity under these conditions? 17. A patient who has just been extubated is exhibiting mild respiratory distress. The RCP is asked to administer aerosol therapy to the patient. Which of the following statements are true in this situation? 18. After setting up a partial rebreathing mask on a patient at a flow of 8 L/min, the reservoir bag collapses before the patient finishes inspiring. The respiratory care practitioner should do which of the following? 19. In order to help prevent Retinopathy of Prematurity, it is recommended that the PaO2 should be kept to what values during the first week of life? 21. A RCP is asked to disinfect a piece of respiratory equipment. Which of the following procedures would you choose to do this? 22. Which of the following are considered high flow devices? 24. Which of the following conditions conform to the standards set for a patient in tuberculosis (AFB) isolation? 25. It is recommended to use a filter small volume nebulizer when administering which of the following drugs? 26. Your patient has a temperature of 98.6 degrees F (37 degrees C). To saturate the inhaled air to normal body conditions, how much absolute humidity must be provided? 29. You receive a physician’s order to provide 28% oxygen via nebulizer to a spontaneously breathing patient with a peak inspiratory flow rate of 48 L/min. What flowmeter setting must be utilized in order to provide a total flow rate of gas delivery that is greater than the patient’s inspiratory flow rate? 30. While administering O2 through a non-rebreather mask, a patient suddenly becomes more dyspneic and experiences respiratory distress. Which of the following actions are correct for the RCP to take? 31. While making O2 rounds you discover that the 6-inch reservoir tubing on a T-piece (Briggs) adapter setup has fallen off. What may result from this? 33. A patient receiving 38 mmHg per liter of gas from a nebulizer has a humidity deficit of which of the following? 34. Which of the following humidity devices is capable of providing 100% of a patient’s body humidity? 36. Which piece of equipment would be needed to set up a tracheostomy collar on a patient? 37. Which of the following methods of disinfection are effective against TB, bacteria, viruses, and fungi? 38. An H cylinder of oxygen was placed in service with 2000 psig and has been used for 5 hours at a flow rate of 10 L/min. It can be used for how many additional hours? 40. How long will an H cylinder take to empty running at 12 LPM with 1200 psig? 42. A patient is receiving O2 via simple mask at 5 L/min. The patient’s SpO2 drops with attempts to decrease the O2 and it is decided that the patient should wear the mask until he becomes more stable. Which of the following should the RCP recommend? 43. Indications for warm humidity therapy include which of the following? 44. How long will an E cylinder with 1000 psig last running at 5 L/min until it reaches 200 psig? 45. Biologic indicators are used in decontamination procedures for which of the following reasons? 48. A patient is receiving oxygen from an “E” cylinder at 4 L/min through a nasal cannula. The cylinder pressure is 1900 psig. How long will the cylinder run until it is empty? 50. Your patient has an endotracheal tube in place. Which of the following devices would be the least effective in reducing this patient’s humidity deficit? 51. Two flowmeters are needed to supply a FiO2 of 60%. What flow rate needs to set on the oxygen flowmeter, and what flow rate needs to be set on the air flowmeter do delivers 60% FiO2 and keep the total flow at 10 L/min? 52. A patient is on a 30% Venturi mask at an O2 flow of 5 L/min. The total flow delivered by this device is which of the following? 53. A patient has come to the ER with nasal trauma due to a burn. His eyes and nasal area are also very swollen. Which of the following devices would be appropriate to deliver O2 to this patient? 54. While making 02 rounds you notice that a disposable bubble humidifier contains only 20 ml of sterile water. What is the appropriate action to take? 55. You set up a bubble humidifier and no bubbling occurs. What could be the cause of this? 56. Which of the following oxygen administration devices would qualify as a “low-flow” oxygen system? 57. A patient is set up on 40% flow-by, and during inspiration mist is not visible exiting the T-tube reservoir. What should the respiratory care practitioner recommend? 59. Which of the following conditions would be standard requirements for a patient with localized herpes zoster (shingles)? 60. A patient has been supported by a mechanical ventilator using a hygroscopic condenser humidifier (HME) for the last 3 days. Suctioning reveals an increase in the amount and tenacity of secretions. Which of the following actions are indicated? 62. What is the proper rate of external chest compressions for children up to 8 and to the age of puberty? 63. Which of the following sets of ABG measurements would be indicative of a renal compensated respiratory acidosis? 64. Which of the following conditions will appear hyperlucent with retrosternal airspace on a chest x-ray? 65. A patient is being manually ventilated at a rate of 12/min with a bag-valve resuscitation bag. With the oxygen flow running at 8 L/min into the bag, the patient’s PaO2 is 55 torr. Which of the following actions would increase the FiO2 delivered to the patient? 68. Which of the following PaO2 findings is considered severe at any age? 69. On receiving a new medication nebulizer treatment order, the RCP checks the order and finds the order is written incorrectly. What should the RCP do? 70. Which of the following could influence the results of pulse oximetry? 72. You are called to the ER to assess a patient who has suffered blunt chest trauma in an automobile accident. Which of the following clinical signs could indicate the presence of a pneumothorax? 75. In order to palpate for symmetrical chest movement of a patient, the respiratory care practitioner should do which of the following? 77. You are a RCP working in the ER when a MVA victim arrives. You quickly determine that the patient is in severe respiratory distress and has crepitus on the left side of his chest. What should you do to further evaluate these findings? 78. A patient enters the ER in moderate respiratory distress. The RCP is called to asses the patient and determines the following: intercostal muscle use, stridor, slow respiratory rate with an I:E of 1:1. What are possible causes of these findings? 79. A patient has normal breath sounds following therapy. Which of the following best describes this finding? 81. Which of the following are possible techniques to accurately check a patient’s pulse rate? 82. A RCP is called to give a STAT aerosol treatment with Xopenex to a patient in respiratory distress. The patient appears very fearful and anxious and tells the RCP that he does not want the treatment. What action should the RCP take at this time? 84. You enter a patient’s room to give a treatment and observe the patient is unconscious and not breathing. Your first action should be which of the following? 85. You are caring for a patient who attempted suicide by inhaling poisonous fumes in a car with the engine running. What level of COHb is lethal for this patient? 86. Pulse oximetry should NOT be recommended to determine oxygenation status in which of the following situations? B. A patient arrives in the ER department after being pulled from a burning house. 87. A patient who has overdosed on narcotics has been admitted to the ER. The RCP hears course breath sounds in the right lower lobe and it is determined that the patient has aspirated vomitus. Which of the following chest x-ray findings is consistent with this diagnosis? 88. While ventilating a patient with a manual resuscitator, you notice the bag is not refilling adequately. What could be the cause of this problem? 89. An RCP has just performed incentive spirometry on a post-operative patient and when you ask the patient to cough, she states that it is too painful to cough. The RCP should encourage which of the following modifications to coughing? 90. It is determined that a patient’s respiratory rate is 35 beats/minute. This would be considered normal with which patient age population? 91. Which of the following methods may best determine decreased cardiac output and perfusion in the extremities? 92. Physical examination of a patient with pleural effusion might reveal which of the following? 93. You are called to the nursery to help provide emergency care to a 9-month-old infant. The infant has had a cardiac arrest. Which of the following apply to correct technique for providing external chest compressions to this infant? 96. A term used to describe a condition in which a patient has difficulty breathing while in a supine position is which of the following? 97. A patient who is in bed is in respiratory distress, displaying use of accessory muscles and nasal flaring. What is the best explanation for the nasal flaring? 98. While palpating the chest, the respiratory care practitioner determines that is decreased vibrations (decreased tactile fremitus) over the right lower lobe. This may be the result of which of the following? 99. After two attempts at opening the airway and providing ventilation to an infant, you cannot confirm adequate air movement. At this point, what should you do? 101. A patient coughs up dark, yellow sputum after an IPPB treatment. Which one of the following statements is TRUE in regard to this sputum production? 104. The compression-breath ratio for one-rescuer CPR on an adult victim is which of the following? 105. You measure the blood pressure of a patient as 88/53. Which of the following entries would you use to describe this finding? What is the cause of his symptoms? These results indicate which of the following conditions? 109. A patient arrives in the ER after being pulled from a burning house. The RCP places a pulse oximeter on the patient’s earlobe and obtains a SpO2 reading of 93%. An ABG is drawn and the SaO2 analyzed by co-oximetry is 76%. Which of the following is the most likely reason for the discrepancy in the two saturation readings? 112. During a physical examination, it is determined that a patient has 2+ pitting edema in the extremities. What are possible explanations of this finding? 113. Which of the following arteries is palpated to determine absence of a pulse in infants? 114. A patient enters the emergency department and on initial examination, the respiratory care practitioner observes paradoxical respirations. Which of the following should the practitioner suspect? 115. A patient’s chart has a note on the front stating a “DNR status”. What does this indicate to caregivers? 116. A 3-year-old child enters the ER in mild respiratory distress. The mother of the child suspects that the child has aspirated a coin. What should the RCP recommend? 117. A RCP has just administered an IPPB treatment to a patient. The patient’s BBS reveal rhonchi and the therapist encourages the patient to cough by pushing on the abdominal area during the coughing effort. This patient most likely has which of the following diagnosis? 124. While palpating the chest of a patient, you notice that the trachea is shifted to the right, there is flatness to percussion on the right side and increased tactile fremitus. These findings are consistent with which of the following? 127. It is determined that the P50 for a patient is 42 mmHg. Which of the following conditions could this patient be experiencing? 128. In inspecting an elderly female patient, you note that her spine has an abnormal anteroposterior (AP) curvature of the upper spine which results in a hunchback appearance. Which of the following terms would you use in charting this observation? 130. A patient with pneumonia and fever of 103 degrees F is sitting up in bed. Her respiratory rate is regular and 35 times a minute. Accessory muscles of ventilation are being used. She is demonstrating which of the following? 132. A heart rate of 160 beats/minute could be considered normal for which of the following patient’s? 135. A patient has a productive cough of clear to white sputum. What does this indicate about the patient’s secretions? So there you have it. I hope this study guide was helpful for you and can serve as a great review for your Patient Assessment Final Exam. As I mentioned before, I realize that each Respiratory Therapy program is different, so I may not have included a question about every single topic that you’ll see on your final exam. Still, if you go through this information, I have no doubt that you can boost your knowledge and improve your final grade when it’s all said and done. Thank you for reading and I wish you the best of luck and as always, breathe easy my friend.